Following the Independent Brewers Association launch of its new Independence Seal on Wednesday night there has been overwhelming support from the ‘indie’ sector. Independent brewers say consumers care about ownership, large brewers say they care about price and quality. Stomping Ground Brewery co-founder Steve Jeffares understands that in less than 12 hours after the announcement, up to 24 member breweries had already signed up. This is “pretty staggering and a very encouraging sign,” he says. 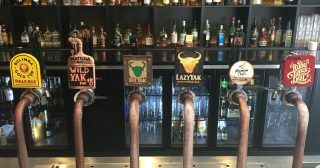 Australia’s largest independent brewery Stone & Wood has also come out in support of the seal saying it will place the IBA seal on its packaging, website and marketing collateral as soon as possible. Summons said that the brewery believed that by supporting local independent breweries, consumers are directly supporting their local community. Rooftop Bar and Garden Venue Manager Nathan Taylor says the seal is great for independent brewers in the long run. However, he feels that there are going to be some teething issues. “There’s going to have to be a lot of education around what it means to be independent,” he says. Conversely, Brewers Association CEO Brett Heffernan says he’s very relaxed about the independence seal. “Consumers care about two things, quality and price. Punters don’t care who makes beer, they just want the beer they love at affordable prices,” he says. Newly appointed IBA CEO Alexis Roitman disagrees. “The fact is, Australians really care about the provenance of their beer. They are really responding to the quality and diversity of the beers produced by independent brewers,” she said. The IBA defines an independent brewery as any brewery or brewing company that is less than 20 per cent owned by a large brewer and produces less than 40 million litres per annum. This change is a great opportunity for independent brewers to step up with pregnancy warnings on their labelling. Very, very few currently have the pictogram on their labels. With the Federal Government currently undertaking a major review of voluntary pregnancy warnings on-label, this is a perfect time for indie brewers to deal themselves into a major industry issue in a positive sense. To Brett’s above comment – that is ridiculous. You’d have to have FASD yourself to not know it’s safer not to drink during pregnancy. Seems like a nice fig leaf for the major brewers to appear like they’re doing the right thing, all the while deliberately pushing on softer boundaries -i.e. targeting beers to teen drinkers, or ignoring the negative side to their connections with major sporting events, or their collusion with pokie pushers.